As you know by now, annotation of your data is stored in R2 as “tracks”. Within R2, one can easily create new annotation tracks. This can be done either based on results generated within analyses, or completely independent by uploading of tracks. In some cases it is of interest to start comparing one track with another. The type of statistics used to compare the tracks depends on the type of data; either categorical or numerical. One may wonder if there are significant overlaps between 2 tracks (with categorical variables), based on Fisher”s exact test. Alternatively, if there are multiple numerical tracks available; one may wonder if there is a significant correlation between 2 tracks. For these cases, R2 contains the Annotation modules; “relate 2 tracks” and “annotation plotter”. 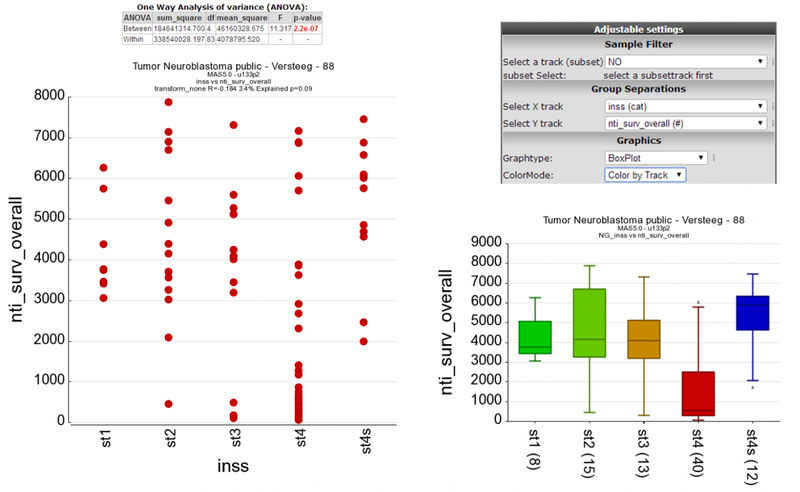 Make sure that you are on the “main” page of R2, and that the selected dataset is “Tumor Neuroblastoma public - Versteeg - 88 - MAS5.0 - u133p2”. From the “type of analysis” dropdown select “relate 2 tracks”, which can be found in the annotation subsection and press next. 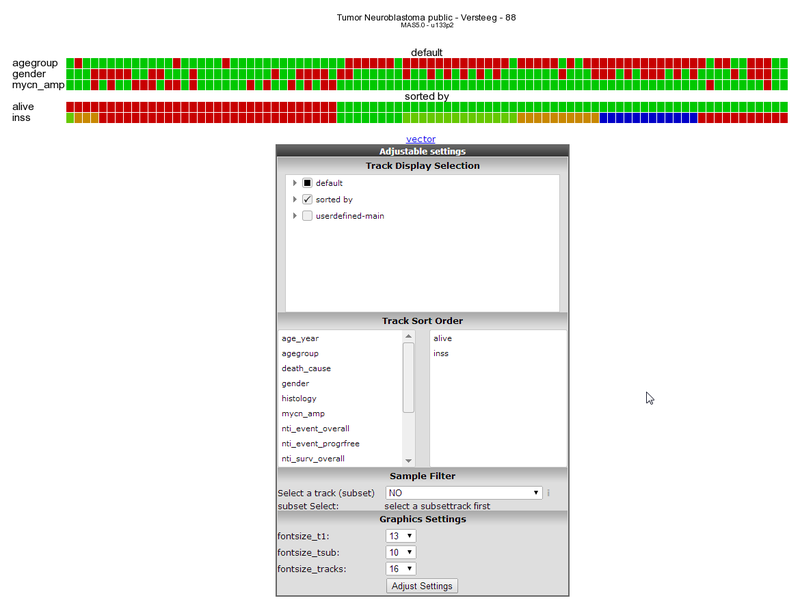 Figure 1: Select “relate two tracks”. For the different tracks, make sure that you select a categorical one (which can be recognized by (cat)). Let”s investigate whether there is a relation between the neuroblastoma age-group (track=agegroup, flip point being 18 months at diagnosis) and the survival status (track=alive). Then press next to generate the result. The generated result is now displayed on the screen. As we are testing 2 categorical variables, R2 has tested the relation between the 2 tracks and finds a highly significant Fisher”s exact p-value, indicating that there is a relation between the agegroup and vital status of the patients. The result is also shown in a honeycomb image, where every individual patient is represented as a separate circle, with the annotation as a hover box. One can add more visual information to the plot, by coloring the patients on the basis of a track. From the adjustable settings at the bottom of the page, set the “colormode” to “color by track” and select the “inss_stage” as track. Press the adapt settings to create an updated image. Now we can clearly see that there is a great over-representation of stage 4 patients in the group of diseased patients who are older than 18 months. As you may appreciate, the combinations that you can make here are virtually endless. We have named this analysis the ‘Visual Fisher’s Exact test’, due to the visual additional insights that it provides over the ‘normal’ p-value that can be interpreted for this test. Just as in the previous example, we select the “relate 2 tracks” option from the main R2 screen and press enter. Now this time, we select 2 numerical tracks, which can be recognized by the (#) sign at the end of a track. 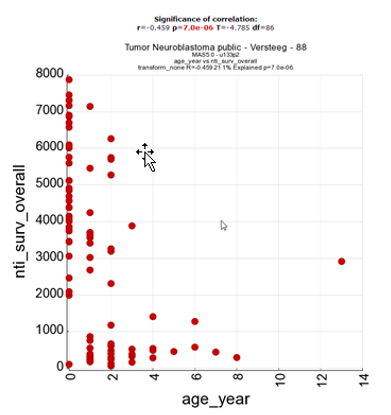 Within the Neuroblastoma dataset our options are limited for this example, so we select the “age in years” track vs the “nti_surv_overall” track and proceed to the next screen. In the result page, R2 has detected that 2 numerical tracks were selected, so the correlation between the different tracks is being displayed and tested for statistical significance. Just as in the previous example, we could color the patients by a track if that would be appropriate. The last example for relating 2 tracks, involves the combination of a numerical one to a categorical track. Essentially, this option allows you to test meta-gene data (such as combined expression values of multiple genes expressed as a single value) as well, where you could create a track containing only value information for the patients, and test this track to clinical parameters. We again select “Relate 2 tracks” from the main menu and navigate to the next page. From the track options, we choose a categorical track for X (inss stage), and a numerical one for Y (nti_surv_overall) and navigate to the next page. The result page will now start to look like view a gene in groups, only this time using the data contained in your track. Via the adjustable settings, you can change the representation to another plot type, such as a boxplot, change the colormode to color by track, and you have a nice result here, showing that the survival rate is significantly lower in patients of INSS stage 4. As a recap for the last 3 tutorial steps, you have used the “relate 2 tracks” option from the annotation methods in R2 and represented different types of tracks with each other to gain new insights from combining 2 tracks. Below the 3-different representations are depicted side by side. Do remember, that this module allows you to use “meta data” tracks that you can assemble either within, but also outside of R2 via the uploading of a track option that will be shown in the “adapting r2 to your needs” chapter. In some publications, patient data is represented in slick looking annotation plots, showing the patient characteristics in rectangles. In a sense, these are just like the tracks that are represented underneath YY-plots in R2. To allow users to create these “track” figures, ordered in a user provided order, we have implemented the annotation plotter in R2. Make sure that you are on the “main” page of R2, and that the selected dataset is “Tumor Neuroblastoma public - Versteeg - 88 - MAS5.0 - u133p2”. From the “type of analysis” dropdown select “Annotation plotter”, which can be found in the annotation subsection and press next. The default view for the dataset will be plotted. Now one can change the tracks to display (with track display selection), as well as the order in which the samples should be ordered (track sort order). The order in which tracks are selected for ordering will also dictate the final sort. For some complicated sorts, it may be necessary to create a numeric track that puts the sample in the intended order.